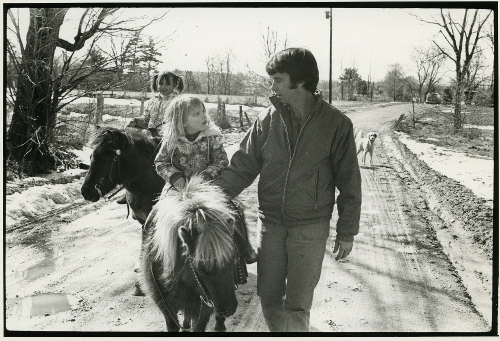 Photograph of John Stanley walking beside his daughters, Tammy and Susan, who are riding ponies. They are on Potwine Street in South Amherst. A dog can be seen standing in the background. Waggoner, Karen, “Tammy and Susan Stanley assisted by their father, John Stanley, ride down Potwine Lane in South Amherst on Sunday afternoon,” Digital Amherst, accessed April 23, 2019, http://www.digitalamherst.org/items/show/1872.